I attended a Hip concert for the twelfth time last night. I fear it may have also been my last. It's the first time I've gone solo to a Hip show, so I jumped on my bike at 6:30pm and head east to the ACC. It was hot, tailgaters were having a blast by Ontario Place and Jays fans were collecting near the dome. I locked up my bike, bought a tee shirt and got to my seat by 8pm. The Hip opened with Courage and didn't let up for 2.5 hours. It was an incredible performance with a stellar playlist. What struck me as a huge fan for 27 years was how heavy certain lyrics sound when sung by a man with terminal brain cancer. 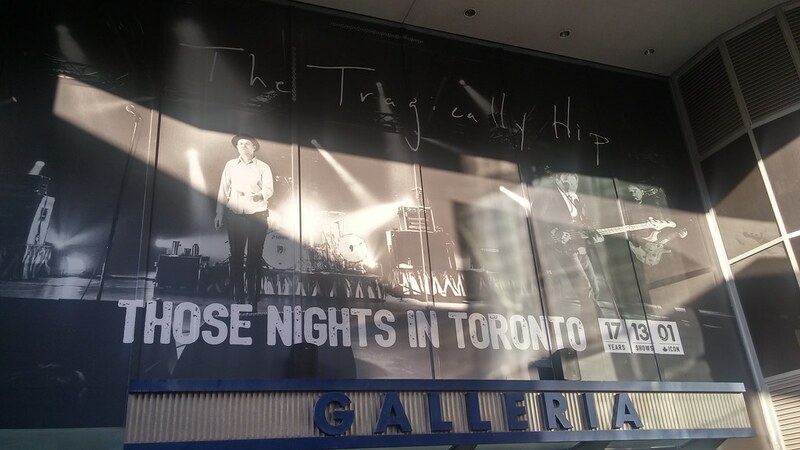 The Tragically HIp closed with Ahead By a Century. In '99 I heard them play this song at the stroke of midnight on New Year's Eve. Then, it felt hopeful, but last night it felt like goodbye. What I'll remember most is the total and absolute mutual adoration and admiration. 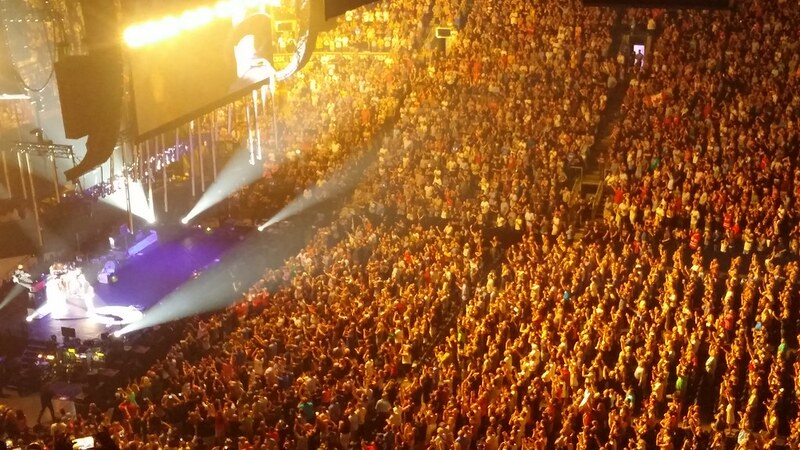 All 20,000 were there to let Gord know he's appreciated. I have never, ever heard the ACC that loud, and I was at the gold medal juniors game against Russia. This level of love and respect was something very, very special. Gord was in good spirits the entire night, full of knowing smiles and delivering the strong performance to which we Hip fans have grown accustomed. When Gord stood on stage after Ahead By a Century before the house lights went on, I didn't want him to leave. I wanted him to stay there forever. I did not want this concert to end. 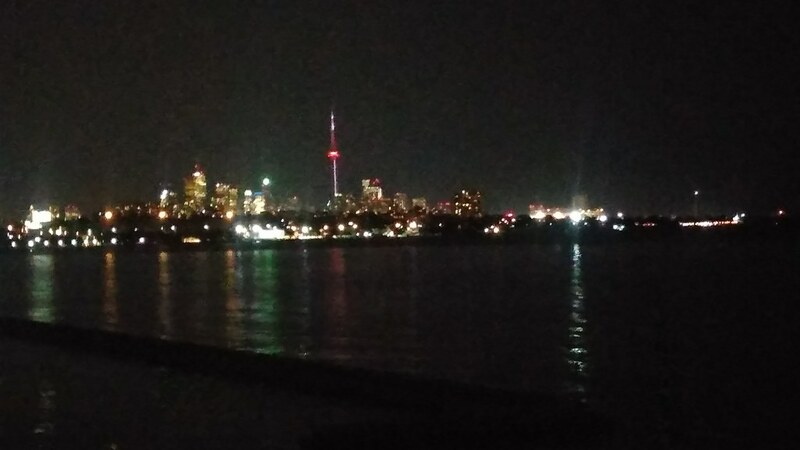 Then, in the dark of night, I rode home along the lake, singing Hip songs as I pedaled. Nice tribute Mike, count your self lucky for getting the single seat. I will have to enjoy it on the 20 th on the cbc. Hi Mike - Long-time listener, first time poster. I was there last night as well; show number 17 for me. I'm still coming to terms with the fact that I watched Gord walk off the stage for the final time. Their February 2002 show at Lee's Palace was my most memorable concert experience to date, but last night may have topped it. As powerful and emotional as it gets. I agree with your comment about the volume in the ACC. I found the crowd volume hit its peak during the "Him? Here? Now? No!" section at the end of Grace, Too as Gord walked back and forth from one edge of the stage to the other. Possibly the loudest cheers I've ever heard. Sounds like a great event. You should do a quick podcast to talk about it, maybe have an industry guy on to talk about the Hips impact? Alan Cross or Jeff Woods again would be cool. that rivals those of Stompin Tom Connors). I could then I might learn to appreciate the Hip's music. Great write up Mike, It was amazingly loud in there Wednesday when I went to the show, I thought it was possibly the fact that I was on the floor for the first time and hearing the crowd from a different perspective. I'm glad it was roar of appreciation for Gord and the boys. This was my 6th show. all but one since 2000. During the early days i was a struggling artist and really busy not making a dime so i had neither money or time to see them. I really wish i had made it to one of the another roadside attraction shows. It's kind of funny i never really realized that there were stupid hip fans until recently( no seeing them early on probably the reason) . I'm in a minority of my friends in loving the band and the lyrics most like them but many are indifferent. It wasn't until Mike mentioned it in a podcast ( Jeff woods?) that i thought about who i saw at shows and thought . Hmm yes a few asshats were there. Of course I don't care. Not liking an artist because of there fans seems kind of silly. I'm on the standby list to see the final concert with boom! Keep your fingers crossed for me tomorrow morning with Stu Jeffries!!! To me its perfect they finished with "Ahead By A Century". I know some Hip fans will say it was just their top 40/popular song but for me its their signature piece. Just as Let It Be by the Beatles, Every Breath You Take by the Police, and One by U2 are for their respective bands, Century is IT for the Hip. That signature song happens at the band's peak and no other song they compose can match it. Its not just the composition, its the performance in the recording of that song. I know, its all just my opinion but like I said, it was fitting that they ended their concert with century. I'm so sorry I missed it. DAMN YOU, TICKETMASTER!!! Like one of the previous posters mentioned, I was never a "huge fan" of the Hip back in the 90s. But, I can appreciate what they have done for the Canadian music scene. It is bad enough that I will never get the chance to watch the likes of R.E.M., Stone Temple Pilots, Nirvana or the Beastie Boys play live, so I didn't want to miss out on an opportunity like this so I could better understand what makes the Hip so popular in Canada. Fortunately, one of my friends had an extra ticket to the final show, which ended up being both my first and last Hip concert unfortunately. 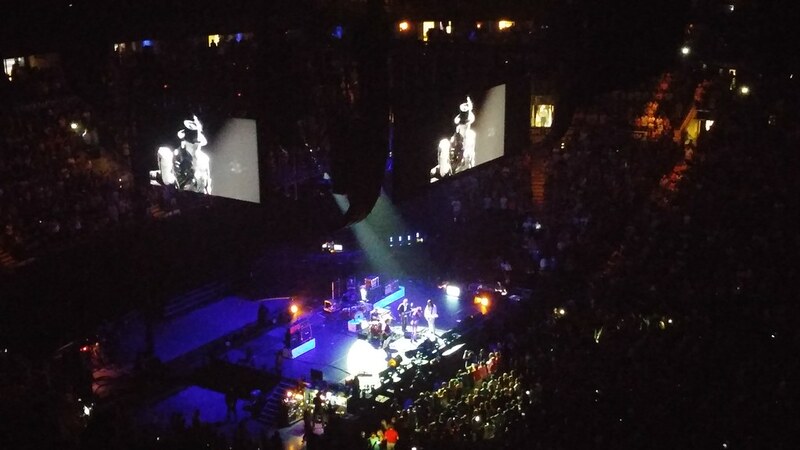 The lessons I have learned through this experience is you have to face your fears in life with dignity, like Gord is doing courageously, and if there is a general buzz about an artist or band, then you damn well better make an effort to try to see them in concert at least once in your life even if you aren't a devoted fan. Who knows? Maybe that one concert will change your opinion like mine did with this Hip concert. Wishing Gord some peace and comfort in his remaining days. Mike, this seems up your alley! Only 12 comments? C'mon, we can do better... Leave a comment above and let's keep this conversation going!